Hailed as ‘the hottest beauty trend of 2014’ by The Times, Rejuvenated Ltd.’s Collagen Shots also come highly recommended by not one, but two of our über-discerning Cult Beauty Experts – Daniel Sandler and Karen Cummings-Palmer, our resident health and nutrition consultant. 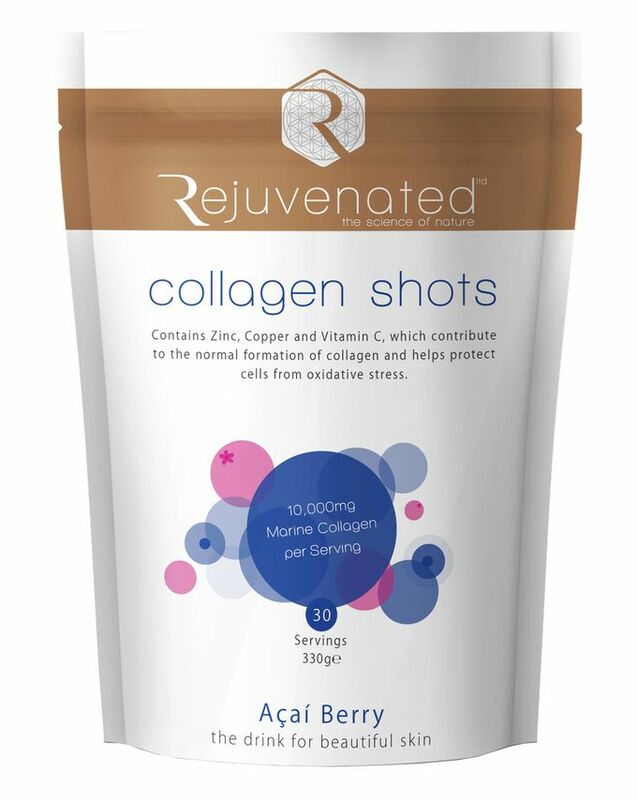 We’re all familiar with the mantra “you are what you eat” and these Collagen Shots are true testament to this philosophy; an anti-ageing cocktail, brimming with skin-firming marine extract collagen (10,000mgs per serving), alongside antioxidant Acai berry, plumping hyaluronic acid and vitamins B and C, to deliver potent skin benefits from the inside, out! Just one shot a day is all it takes to gradually (but dramatically) improve the appearance of skin’s tone and texture – ‘plumping’, firming and reducing the appearance of tell-tale lines and wrinkles. Bottoms up! Collagen is effectively the ‘fabric’ of the skin – interwoven strands, which provide skin strength, elasticity and structure but sadly (like mum’s Laura Ashley sofa) – gradually show signs of wear and tear. Collagen synthesis starts to slow down at around age 25 (eeeeek!!!) and reports show that by the time you hit 45, collagen levels have fallen by as much as 30% – which is when those creases really start to make themselves at home. So ‘three cheers’ for Rejuvenated Ltd.’s Collagen Shots, which have been proven to bolster collagen levels and in turn, repair fraying fabric to restore skin’s pliability and thickness, and counteract sagging, dehydration, crêpiness and wrinkling. So don’t resign your skin to the beauty attic, just conduct a little backstage reupholstery, to make it look as good as new. To get the best benefits from Collagen Shots take daily, ideally half an hour before going to sleep at night, this is when cells are renewing. Alternatively have on an empty stomach either first thing in the morning or before a meal. Put one scoop in a glass and fill with 200 - 250ml of water (or preferred beverage), whisk with a fork, allow a minute for collagen to dissolve - whisk again and drink. You could use a small blender or shaker for mixing. Not advisable for those with fish or shellfish allergies. I didn't purchase these from cult beauty but happy to see they are in stock after raving to my family and friends about it. It is worth every penny- I don't tend to write reviews but I'm still in awe of how well this collagen supplement works overall and compared to others in the market. I've been taking it for two months and really for now I do not see much change in my skin .... maybe something more glowy, but the thin lines around my eyes are still there. It will be a short test time, I do not know really.... Nice taste. Somehow caused me acne, but maybe not direct cause. I love this product, I have been taking this mostly for over two years now. I can see the difference in three weeks. It plumps up the skin, makes it look hydrated and healthy. I would highly recommend this. Producto excelente. Lo tomo por las noches y se notan los resultados en la piel y el pelo.Estoy encantada con él y no me importa pagar el precio que tiene.A treasure. " Excelent product. I take it at night and the results are noticed in my skin and hair. I'm delighted with the product and I do not mind paying the price. A treasure"
I have a connective tissue disorder and don’t produce enough collagen, which is why I tried this. But additional bonuses is my dry eyelids and skin tone has evened out, softer skin, hands look also look smoother and lines on face reduced. Completely recommend. I don't know about the other reviews, but I am 66 and just started taking my daily shots. I will say I have great skin and I am always trying new things and looking for the best out there. I will update my honest review after 30 days. I am giving 4 stars right now for taste and ease of using the product. I have just finished my first pack of Collagen Shots after taking them daily, each morning for 2 months and I have noticed that my skin does appear to look more fresh and plump. I was under a lot of stress towards the end of last year and suffered from dark circles and since taking this shots, i can safely safe that my dark circles are faded away and gone back to my usual firmness around my eye area. I also feel that my overall skin texture all over my body feels somewhat more firm. Big thumbs up to this product, i will continue to use this as I age! All that is written above is the TRUTH. Fantastic product. Must try. Great flavour, mixes well, I see a little improvement in my skin but I have only been taking it for about 4 weeks. I will continue to use this collagen and compared to other brands of collagen this is my favourite. I've tried many beauty supplements,and this is just the best collagen shot I've tried so far. Only thing is, I recommend drinking it on empty stomach or else. I have been using the collagen shots on and off for the past year and I couldn't have chosen better! Even after a couple of weeks, I could notice the changes in my complexion - smoother, fresher, younger looking skin. Even my heels got softer. I can highly recommend this product. I have tried & tried collagen supplements from here to Timbuktu. Ok well from here to Japan, South Korea & the U.S & this is by far the tastiest & one of the strongest being 10,000mg - It mixes so easily in water (put the powder in first) & genuinely tastes nice. Their attention to detail as a company is fantastic - super high quality ingredients & of course my skin is definitely plumper and softer, however, I am 28 but still taking all the help I can get. Highly, Highly recommended. I'm turning 33 this year and have been quite perturbed at the lines that have occurred either side of my mouth over the past year. They look so ageing and I was moaning to a friend about them and she recommended taking collagen in powder for to add to my daily smoothies. After researching a few I found this one and liked the sound of it. I've only been taking it for 5 days (I drink it before bedtime as that's when skin does it's repairing) and my goodness what a difference I can see to these lines already! I wish I could upload before and after pictures as its so noticeable. This will now be a staple part of my skincare/health regime. I'm so so pleased and will be ordering it again (in bulk probably). I've been raving about it to friends and my brutally honest mum even said she was shocked at the results in just a few days. Ha ha The taste is non offensive. I mix mine with 250ml of coconut water and blend in my nutri bullet. This gives it a frothy almost milkshake consistency and it goes down a treat for someone with a sweet tooth. It's not sickly sweet at all though. Highly recommend. I have been using this product for about 3 weeks, and can honestly say the results are amazing, skin is softer, especially my elbows and heels, have even noticed a softening of the lines on either side of my mouth, big result, as I hated these lines, so will be continuing with this fabulous, very easy to drink, elixir of beauty. Using various supplements to improve skin health and appearance is not a new concept. I have regularly used (and recommended to clients) collagen capsules and other nutrients such as Co-Q10 and Quercetin to support collagen, elastin, and improve cellular function. The idea of a collagen drink was immediately fascinating to me, but I took some time to do my research to sort through the facts. 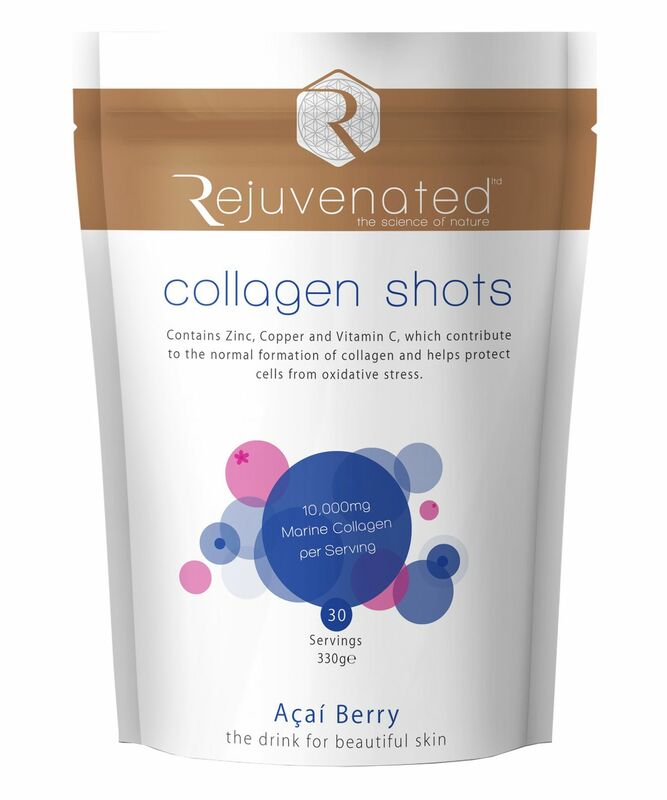 I decided on 'Collagen Shots' by Rejuvenated for several reasons. It contains 10,000 mg hydrolysed marine collagen, which is safe and can be used by most people. This is the highest collagen load I could find, and the studies suggest that this is optimal. Other nutrients such as HA and Acai berry also boost hydration, and add amino acids and omega fatty acids to further support cellular function and improve skin health. The flavour is mild and it's extremely low in calories with no sugar. The powder is easy to store and is easy to mix once a day (best at night but anytime of the day on an empty stomach) with water or drink of choice. The results start almost immediately. Within 2 weeks, an improvement in hydration is noticed and the skin starts to glow. After 4 weeks, the glow is sustained not just on the face but on the skin all over the body. A general feeling of increased energy and well-being is often reported, probably due to the extra nutrients that support the body . This is especially noticed by people who don't usually take daily supplements. Most of the studies support the idea that it takes about 12 weeks to see a difference on the outside: plumper, dewy, more elastic skin. From my own experience and that of my clients, I would say that there is definitely an improvement in the firmness, suppleness and elasticity of the skin. Again, this doesn't only apply to the face, but all over the body. A few of my clients have also commented that their hair and nails seem stronger. That isn't really too surprising and another potentially exciting benefit of the daily use of Collagen Shots.